Our shippers are busily packing up holiday cards ahead of the coming shipping time, and we are so grateful to everyone who's gotten them in to us already! 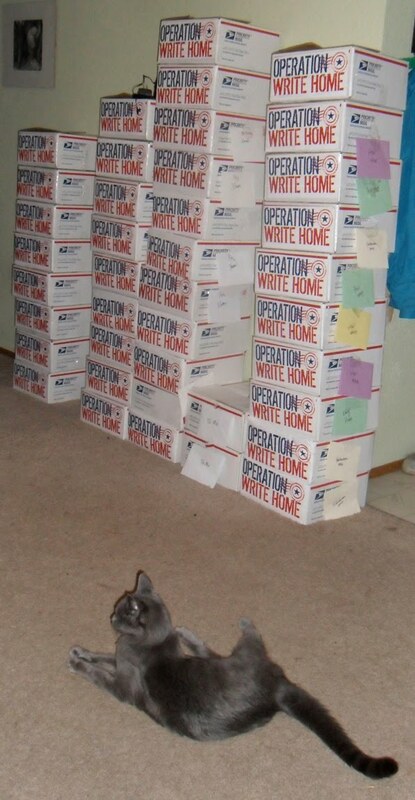 Oliver the cat is bravely watching over the ready boxes; let's hope they don't come tumbling down on him! The left three stacks are Christmas cards - just waiting for 20 hero letters to put in each one, then they will be totally ready to roll! We're currently shipping Halloween cards, along with a mix, in each box; as we get closer to the deadline (Sept 20), you may want to consider making pumpkin cards with "thinking of you" on them if you have an inkling you may not get them to the shipper on time. General pumpkin-y cards can be sent past our Halloween dates since our heroes can use them through October and November. This week 11,882 cards were mailed out - at a cost of $437.50...holiday shipping levels are creeping in!